Ruthiebear (Titusville, NJ, United States) on 26 August 2014 in Animal & Insect. Stunning image! Beautiful colors. HUGS dear friend! such beautiful frame, focus, colors, colors & lighting! A fine use of focus here, a lovely "HST" picture as result. Is that a paper mache bear? Very colorful! Nice detail of this bear for children !! Happy ST:) The colours are great too. A magnificent picture for ST, the colors are very beautiful, a great shot, I like a lot. Happy ST and have a good day. A beautiful bear. 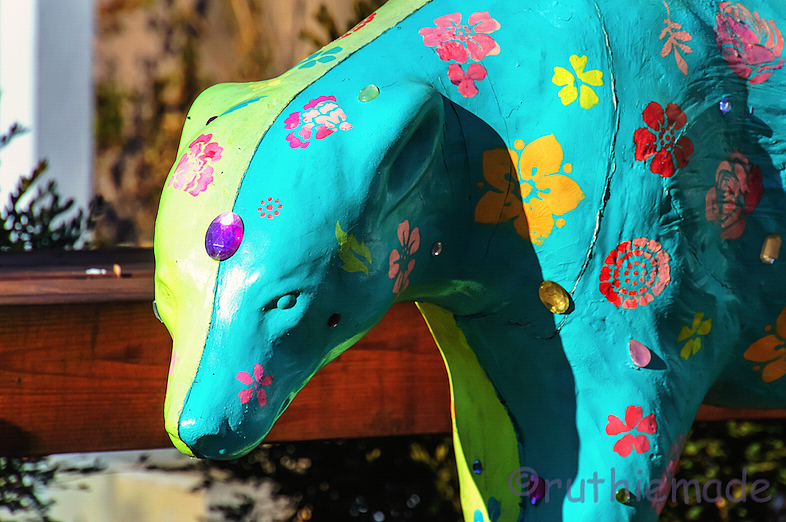 In Sedona, a few years back, they decorated Javelinas in various ways similar to this. A few still remain that businesses apparently bought. He is beautifully decorated! Someone did a wonderful job! Happy ST! Un bien bel ours une belle couleur superbe œuvre d'art.